Intermediates and final products of protein aggregation play crucial role in the development of degenerative changes in a number of neurological diseases. Pathological protein aggregation is currently regarded as one of the most promising therapeutic targets for treatment of these diseases. Transgenic mouse models of proteinopathies are an effective tool for screening and validation of compounds, which can selectively affect metabolism of aggregate-prone proteins. 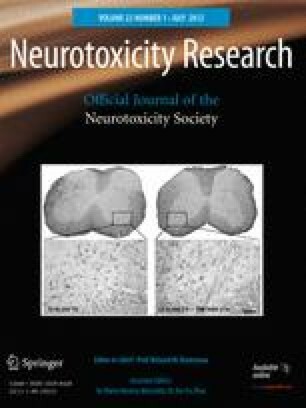 In this study, we assessed effects of dimebon, a compound with known neuroprotective properties, on a recently established transgenic mouse model recapitulating key pathological features of amyotrophic lateral sclerosis (ALS) as the consequence of neuron-specific overexpression of γ-synuclein. Cohorts of experimental transgenic mice received dimebon in drinking water with this chronic treatment starting either before or after the onset of clinical signs of pathology. We detected statistically significant improvement of motor performance in a rotarod test in both dimebon-treated animal groups, with more pronounced effect in a group that received dimebon from an earlier age. We also revealed substantially reduced number of amyloid inclusions, decreased amount of insoluble γ-synuclein species and a notable amelioration of astrogliosis in the spinal cord of dimebon-treated compared with control transgenic animals. However, dimebon did not prevent the loss of spinal motor neurons in this model. Our results demonstrated that chronic dimebon administration is able to slow down but not halt progression of γ-synucleinopathy and resulting signs of pathology in transgenic animals, suggesting potential therapeutic use of this drug for treatment of this currently incurable disease. A nonprescription drug dimebon used as an antihistamine for more than two decades has recently attracted renewed attention of both researchers and clinicians because of its newly discovered effects on pathological processes associated with neurodegenerative diseases and benefits to patients in several clinical trials. A promising results of the Phase II clinical trials of dimebon in patients with Alzheimer’s disease (Doody et al. 2008) and Huntington’s disease (Kieburtz et al. 2010) inspired a number of studies in various in vitro and animal models of molecular pathologies, associated with neurodegeneration, as well as continuation of clinical studies. Although preliminary and yet formally published results of larger Phase III clinical trial in patients with Alzheimer’s disease appear to be less assuring than results of the Phase II trial, dimebon is still considered as a promising therapeutic medicine for neurodegenerative diseases, particularly in combination with other drugs. For example, a clinical trial is currently under way to assess efficacy of dimebon in combination with Arisept for treatment of Alzheimer’s disease. Progress in clinical and pre-clinical studies of dimebon is compromised by very vague understanding of the mechanism of its action on the degenerating nervous system. Various targets of dimebon have been suggested, including mitochondrial defects (Bachurin et al. 2003; Zhang et al. 2010; Naga and Geddes 2011), glutamate toxicity (Grigorev et al. 2003; Lermontova et al. 2001), serotonine receptors type 6 and 7 (Okun et al. 2010), and other receprors and enzymes (Wu et al., 2008). There are also evidence that dimebon enhances adult hippocampal neurogenesis in mice (Pieper et al. 2010), and improves learning and memory in neurotoxin-treated rats (Bachurin et al. 2001) as well as working memory in rhesus monkeys (Webster et al. 2011). However, these proposed mechanisms cannot explain beneficial effects of dimebon on such clinically diverse conditions as Alzheimer’s and Huntington’s diseases. Yet, there is a common feature in pathogenesis of these two neurodegenerative diseases as both are proteinopathies (Skovronsky et al. 2006; Uversky 2009). Pathological protein aggregation, formation of proteinaceous inclusions and consequent neuroinflamatory reaction in affected regions of the nervous system are hallmarks of these types of diseases, although clinical manifestations vary from principally motor dysfunction in amyotrophic lateral sclerosis (ALS) to essentially cognitive impairment in Alzheimer’s disease or dementia with Lewy bodies. Therefore, it was feasible to suggest that an important if not the main target of dimebon in the degenerating nervous system is protein aggregation with inclusion formation and/or intraneuronal systems of aggregates clearance. Several studies have demonstrated that dimebon indeed can affect protein aggregation as well as associated pathological changes. The drug has been shown to reduce the number of TDP-43 aggregates in SH-SY5Y cells expressing mutant forms of this protein and to increase extracellular Aβ levels in neuroblastoma cells, expressing mutant APP (Yamashita et al. 2009; Steele et al. 2009). However, in two studies that used TgCRND8 Alzheimer’s disease mouse model, conflicting results have been reported on dimebon ability to affect APP or oligomeric Aβ levels although the discrepancy was attributed to the differences in drug dose and treatment duration (Steele et al. 2009; Wang et al. 2011). The drug was not effective in a transgenic mouse model of α-synucleinopathy recapitulating some features of early stage of Parkinson’s disease (Shelkovnikova et al. 2011). Therefore, available data describing effects of dimebon on neuropathology mediated by protein aggregation are sparse, contradictory, and need clarifying. Here, we studied the effect of dimebon on protein aggregation and its physiological consequences in a mammalian model of proteinopathy transgenic mice with pan-neuronal overexpression of an aggregate-prone protein γ-synuclein. These mice develop progressive pathology characterized by accumulation of insoluble γ-synuclein species and amyloid inclusions in the nervous system, neuroinflammation, selective cell loss of certain motor neuron populations and selective axonal degeneration that leads to the decline in motor function, paralysis and premature death (Ninkina et al. 2009). Altogether, pathology in these mice recapitulates several key pathological features of ALS (Ninkina et al. 2009 and manuscript submitted). Our data clearly demonstrated that chronic administration of dimebon slowed progression of pathology in this model, suggesting potential therapeutic use of this drug for treatment of ALS and related proteinopathies. A transgenic mouse line Thy1mγSN with high level of pan-neuronal expression of γ-synuclein and deposition of pathological inclusions in the nervous system has been described in our previous publication (Ninkina et al. 2009). Transgenic males were housed one per cage with 12/12 light/dark cycle and free access to food and water. Dimebon was purchased from NPO Organika (Novokuznetsk, Russia). Two experimental groups of transgenic mice received dimebon (10 μg/ml) in drinking water from the age of 3 or 6 months. Control group of littermates continued to receive normal water. All animal experiments were carried out in accordance with the UK Animals (Scientific Procedures) Act, 1986. The motor performance of control and experimental transgenic as well as wild-type mice was evaluated in accelerating speed rotarod test at the age of 2, 4, 6, 9 and 12 months. Animals were trained on the UGO Basil rotarod (model 7560, Italy) for 5 min, using a constant speed (8 rpm) mode. Later, on the same day each animal was tested three times with 30-min breaks between the trials. The mean of latency to fall for these three trials was included in final statistics. RNA was extracted from the thoracic section of spinal cord, and the first-strand cDNA synthesis and quantitative RT-PCR were performed as described previously (Ninkina et al. 2009). Primers 5′-CCATGGACGTCTTCAAGAAAGG-3′ and 5′-CGTTCTCCTTGGTTTTGGTG-3′ were used to amplify γ-synuclein cDNA. GAPDH mRNA (primers 5′-CACTGAGCATCTCCCTCACA-3′ and 5′-GTGGGTGCAGCGAACTTTAT-3′) was used as the normalization standard. Fold change was determined by 2−ΔΔCT method as described previously (Livak and Schmittgen 2001) using StepOne v2.0 software. Spinal cords of control and experimental animals were collected, processed, embedded and stained with Congo Red, or Cresyl Fast Violet (Nissle staining) or probed with rabbit polyclonal antibody against GFAP (Sigma, USA, 1:500 dilution) as described previously (Robertson et al. 2004). Congo Red-positive aggregates were counted within four randomly selected 50 μm × 50 μm squares (0.01 mm2 in total) in the anterior horn region of 10–15 sections per animal, and the mean number of aggregates per section for each animal was used for statistics. Total number of motor neurons in the anterior horn region was estimated on slides after Nissle staining using the cell fractionator technique and presented as percent of wild-type. All counts were performed by a person blind to the origin of sections. Spinal cords were dissected and thoracic sections from animals of each group were pooled. Samples were processed as previously described (Giasson et al. 2002), with minor modifications. In brief, after homogenization of tissues in 10 volumes of ice-cold high salt (HS) buffer with protease inhibitors (Complete Mini, Roche) and discarding cell debris and nuclei by low-speed centrifugation, samples were centrifuged at 100,000 g for 20 min at 4°C. The supernatant was recovered as HS fraction. The pellet was washed in the same buffer and then re-extracted in HS buffer containing 1% Triton X-100 (TX, or detergent-soluble fraction), followed by high-speed centrifugation as above. The final pellet was resuspended and boiled in a gel-loading buffer with 2% SDS, and designated as detergent-insoluble or SDS fraction. All fractions were run on 16% SDS-PAGE and transferred to PVDF membrane by semi-dry blotting followed by blocking, incubation with antibodies and detection procedure according to previously established protocol (Buchman et al. 2002; Ninkina et al. 2003). Affinity-purified rabbit polyclonal SK23 antibodies (Buchman et al., 1998) were used in 1:500 dilution for detection of γ-synuclein. Mouse polyclonal antibody against β-actin (Sigma) diluted 1:3,000 was used for normalization of protein loading. Statistical analysis was performed using STATISTICA 6.0 software. Non-parametric Mann–Whitney U-test was applied to assess differences between dimebon-treated and control groups. Experimental mice received water solution, containing 10 μg/ml of dimebon, which allowed reaching an average daily dose of ~1.5 mg/kg, corresponding to the dose used in clinical studies (Doody et al. 2008). Dimebon stability in solutions has been properly addressed recently (Nirogi et al. 2009), confirming its good perseverance in water. As has been shown by others (Giorgetti et al. 2010; Wang et al. 2011), dimebon is completely eliminated from plasma and brain within 6 h after administration of a single oral dose but unlimited access to drinking solution in our study ensured non-interrupted exposure to the drug and maintenance of its pharmacologically relevant level in the nervous system. The age of onset for obvious clinical signs of pathology in Thy1mγSN mice is around 6 month. The disease gradually progresses leading to severe muscle weakness and limb paralysis that result in rapid wasting. Mice usually reach 1 year with only about 10% survive for more than 15 months. We assumed that experimental cohort with early start of treatment will more likely to benefit from drug administration. To assess whether dimebon exerts more pronounced effect when introduced at early, preclinical stage, i.e., when accumulation of γ-synuclein has not yet resulted in obvious motor abnormalities, compared with the early clinical stage, when locomotor impairment can be already detected by instrumental tests, we employed two mouse cohorts. Animals from the first cohort received dimebon in drinking water from the age of 3 months and animals from the second group—from the age of 6 months. Control groups of littermates received drinking water without any additives. Mouse motor function was assessed using accelerating rotarod test before and at several time points after beginning of drug administration. Animals from the first experimental cohort (early drug start) were tested at the age of 4, 6, 9 and 12 months, and animals from the second experimental cohort (late drug start) at the age of 9 and 12 months. Statistically significant improvement of animal performance compared with non-treated controls was achieved in both groups after 3 and 6 months of dimebon treatment, though treated animals never reached the same level of performance as wild-type mice (Fig. 1a). Notably, mice in the group with late start of drug treatment significantly underperformed compared with mice that were treated from the earlier age. Because the beneficial effect of the drug on the motor function was significantly more prominent for the latter group, our subsequent studies were performed mostly with mice from this group. To evaluate changes in the lifespan, we daily evaluated conditions of mice in experimental and control groups to detect either natural death or severe stage of wasting, when they had to be culled to prevent further suffering. The modest but statistically significant increase in the lifespan of transgenic mice treated with dimebon has been registered from the age of 3 months, comparing with untreated mice. Occasionally, treated animals lived as long as 18 months (Fig. 1b). Thus, using rotarod-assessed motor function and lifespan as end points, we demonstrated that chronic dimebon administration in the used mouse model of proteinopathy was beneficial at both early and advanced stages of neurodegeneration, with clear advantage of the early start of the treatment. Presence of proteinaceous inclusions in the nervous tissue is a hallmark of advanced stage pathology in proteinopathies (Skovronsky et al. 2006). There is no general consensus about the role and hazardous potential for these structures. Widely accepted current view is that they are non-toxic and even protective in contrast to toxic soluble oligomers (Bucciantini et al. 2002; Lashuel et al. 2002; Caughey and Lansbury 2003), whereas there is clear evidence of correlation between inclusion load and disease stage (Thal et al. 2002). In Thy1mγSN transgenic mice, multiple amyloid inclusions of various size can be detected throughout the nervous system, and the number of inclusions in the spinal cord directly correlates with the severity of motor impairment (Ninkina et al. 2009). We assessed the number of pathological inclusions, revealed by Congo Red staining, which selectively detect amyloid structures, in the anterior horn area of the spinal cord sections from dimebon-treated and control transgenic animals. Significantly lesser number of inclusions was detected in treated animals (Fig. 2). Although the difference between two dimebon-treated groups was not statistically significant, the trend of more pronounced decrease in inclusion numbers in the group with early introduction to the drug was obvious (41.2 vs. 27.5% decrease), which is consistent with the results of rotarod performance of these animals. To confirm observed effect of dimebon on accumulation of insoluble fibrillar γ-synuclein species by an alternative method, we used sequential fractionation of spinal cord proteins with buffers of different detergent composition. The presence of abundant aggregated γ-synuclein species in a detergent-insoluble fraction of the spinal cord of Thy1mγSN mice has been shown previously (Ninkina et al. 2009). Five samples of thoracic spinal cords were pooled for a group of 12-month-old mice treated with dimebon from the age of 3 months and five samples—for a group of age-matching control mice. Proteins were extracted from these pooled “averaged” samples by extraction/ultracentrifugation as described in Materials and Methods. Resulting salt-soluble (high salt, HS), detergent-soluble (Triton X-100, TX) and insoluble (SDS) fractions were analysed by gel electrophoresis and immunoblotting with antibodies against mouse γ-synuclein. We detected a substantial decrease in both monomeric and high molecular weight γ-synuclein species in detergent-insoluble fraction extracted from tissues of dimebon-treated compared with control transgenic mice, while the levels of salt-soluble (HS) and detergent-soluble (TX) forms were not essentially affected (Fig. 3). This effect was not because of reduced transgene expression in the drug-treated mice because quantitative RT-PCR analysis revealed no differences in spinal cord γ-synuclein mRNA levels between two groups of animals (data not shown). Chronic neuroinflammation characterized by appearance of activated microglial and astroglial cells in affected regions of the nervous system plays one of the central roles in the progression of neurodegeneration (Glass et al. 2010). Although dimebon has been originally developed as an antihistamine, and therefore might ameliorate inflammatory response in the degenerating neural tissues, this effect of the drug has not been assessed so far. In Thy1mγSN mice, the development of motor pathology is accompanied by progressing neuroinflamation characterized by a marked activation of astroglial cells in the spinal cord (Ninkina et al. 2009). We compared the severity of reactive astrogliosis in the spinal cord of dimebon-treated and control transgenic mice. Considerable reduction in the number of activated astrocytes revealed by immunostaining with antibody against GFAP was observed in animals that received the drug for 9 months (Fig. 4). Thus, reducing inflammatory response may contribute to neuroprotective action of dimebon. Another pathological feature typical to Thy1mγSN mice is age-dependent loss of motor neurons in the spinal cord (Ninkina et al. 2009). It was feasible to suggest that physiological, behavioural and morphological improvements observed in dimebon-treated groups of transgenic mice might be because of the survival-promoting effect of this drug on spinal motor neurons. To assess this, we stereologically counted motor neurons in the anterior horns of the thorasic spinal cord of the same animal cohorts that were used for histological studies described above. Consistent with previously published data, significant (~50%) reduction in the number of motor neurons was revealed in Thy1mγSN compared with age-matching wild-type mice. However, no difference in the number of motor neurons was observed between dimebon-treated and control transgenic animals (Fig. 5). Following first reports demonstrating neuroprotective activity of dimebon, studies of its mechanism of action were focused on traditional targets for this type of drugs, primarily mitochondria, calcium metabolism and various types of receptors. Recently, however, in response to advances in our understanding of the nature of pathological changes during neurodegeneration, the focus has shifted towards less characterized targets, such as protein aggregation (Yamashita et al. 2009; Steele et al. 2009; Wang et al. 2011; Shelkovnikova et al. 2011). In this study, we applied a mouse model of proteinopathy with well-defined and easily detected neurological pathology triggered by overexpression of an amyloidogenic protein γ-synuclein (Ninkina et al. 2009), to investigate specific dimebon effects on protein aggregation and its consequences to animal physiology. This model, Thy1mγSN transgenic mice, also recapitulates several key features of ALS (Ninkina et al. 2009 and manuscript submitted), a proteinopathy for which in vivo effects of dimebon have not been so far tested. We employed two chronic dimebon treatment regimens, starting either before the onset of clinical signs of pathology or after animals become symptomatic. Projected daily dose of the drug corresponded to the dose used in clinical studies (Doody et al. 2008). Groups of dimebon-treated and control animals were assessed for five parameters known to be significantly impeded in Thy1mγSN transgenic mice, namely, the lifespan, the dynamics of motor function impairment, aggregation/fibrillation of γ-synuclein, formation of amyloid inclusions and astrogliosis. Dimebon slightly increased lifespan of Thy1mγSN mice but only when the treatment started before the onset of obvious signs of pathology. This was consistent with results of motor function analysis that revealed better rotarod performance of Thy1mγSN mice that received dimebon from the age of 3 months comparing with mice that received the drug from the age of 6 months. Although both dimebon-treated mouse groups performed in this test better than control transgenic mice of the same age, they were still substantially inferior to wild-type mice and their ability to perform the task gradually declined. Dimebon treatment also reduced the load of amyloid inclusions in the spinal cord of Thy1mγSN mice with larger effect observed in a group of experimental animals treated with the drug from the earlier age. Furthermore, dimebon substantially reduced abundance of detergent-insoluble γ-synuclein species in the spinal cord of these animals. Taken together, these results suggest that dimebon can slow down but not reverse pathological processes triggered by overexpression of γ-synuclein in the nervous system of Thy1mγSN mice. 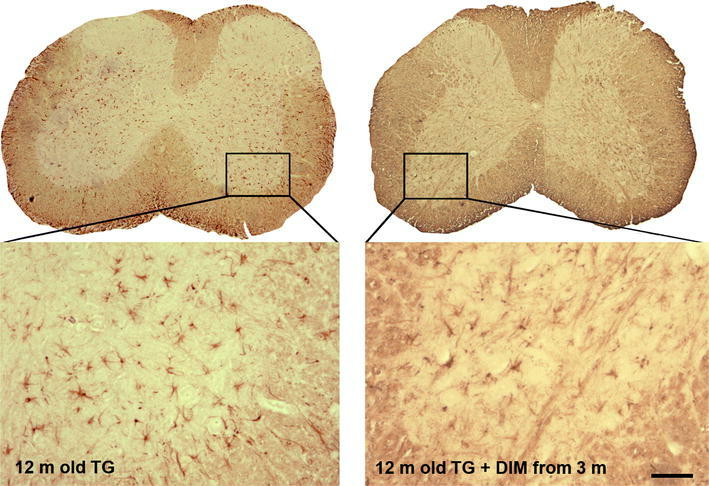 This conclusion is supported by our observation that dimebon treatment alone is not sufficient to prevent the loss of motor neurons at the advance stages of neurodegeneration in Thy1mγSN mice. The ability of dimebon to moderate protein aggregation and decrease inclusion numbers was previously demonstrated only in cultured cells overexpressing aggregation-prone but non-amyloidogenic protein TDP-43. In that experimental system, dimebon reduced the level of insoluble TDP-43 and the number of TDP-43-positive intracellular inclusions (Yamashita et al. 2009). In contrast, in animal studies, either no effect (Wang et al. 2011; Shelkovnikova et al. 2011) or promotion (Steele et al. 2009) of amyloidogenic proteins aggregation were reported. Therefore, our study provides first evidence that dimebon can ameliorate pathological protein aggregation in vivo and suggest that the effect of the drug is target-protein-dependent or/and cell-type-specific. The role of large amyloid inclusions in progression of proteinopathies is a subject of heated debates. Although these structures are clear and obvious histological hallmarks of pathological protein aggregation and might interfere with normal intraneuronal processes simply by mechanical disruption of the cell infrastructure, there is growing body of evidence that most toxic products of protein aggregation are precursors of amyloid-forming fibrils, namely, protofibrils and protein oligomers. Thus, prevention of amyloid formation might be harmful to affected neurons if it leads to increased concentration of toxic precursor species. Yet the ability of the intracellular clearance systems to dispose already formed amyloid fibrils (Rubinsztein 2006), particularly before they form damagingly large inclusions, might make amyloidogenesis beneficial because it could swing the equilibrium of the aggregation/fibrillation process and as the result, reduce intracellular concentration of the most toxic intermediate products. Our observations suggest that dimebon might affect clearance of amyloid inclusions formed by aggregated γ-synuclein, and further studies should reveal what intracellular clearance system might be a target of this drug. Dimebon has been originally developed and used as an antihistamine and therefore belongs to a group of drugs with a well-known anti-inflammatory properties. These agents act through multiple mechanisms, including receptor-mediated and receptor-independent ones, as well as affect migration of inflammatory cells (reviewed by Leurs et al. 2002). It was therefore feasible to suggest that dimebon might affect inflammatory processes in the degenerated nervous system. Indeed, we noticed significantly reduced astrogliosis in the nervous system of the drug-treated transgenic animals, suggesting that dimebon might ameliorate neuroinflammation. Chronic neuroinflammation plays one of the central roles in progression of neurodegeneration (Glass et al. 2010). Inflammatory molecules and reactive oxygen species released by activated glial cells contribute to neuron damage resulting in both apoptotic death of certain neuronal populations and dysfunction of survived neurons. Neuroinflammatory response may result in the damage of the blood–brain barrier, exacerbating existing pathology through immune cells infiltration into nervous tissues and further activation of inflammatory cascades (Farina et al. 2007). Aggregated proteins become able to cross the damaged blood–brain barrier and trigger immune response by inducing autoantibody production (Rowe et al. 1998; Orr et al. 2005; Papachroni et al. 2007). Evidence for specific and important role of activated astrocytes in neuronal dysfunction in proteinopathies is rapidly accumulating (reviewed in Allaman et al. 2011), and normalization of astrocytes function in degenerating nervous system is considered as a promising approach for treatment of these diseases. Pathological protein aggregation and neuroinflammation can be regarded as universal drug targets in proteinopathies, because in the majority of cases, they accompany neurodegeneration and contribute to the development and/or progression of neuronal dysfunction (Archer et al. 2011; Glass et al. 2010). Taken together with the results of previous experimental and clinical studies, our data demonstrated that dimebon treatment might be beneficial at early stages of the certain types of proteinopaties. Significant retardation of pathology progression in an animal model that recapitulates key features of ALS suggests feasibility and importance of further studies of dimebon as a potential therapeutic drug for this devastating and currently completely incurable disease. We are grateful to Herman van der Putten (Novartis Pharma AG) for his involvement in generation of Thy1mγSN mice. This study was supported by the State Contract No16.512.11.2080 (Ministry of Education and Science of the Russian Federation), the Program of Russian Academy of Sciences “Fundamental Sciences for Medicine,” and Research Grants from The Wellcome Trust (075615/Z/04/z) and Alzheimer’s Society (116) to VLB.